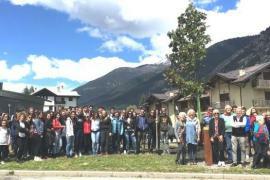 On 17 May 2018 the Garden of the Righteous was inaugurated at the Des Ambrois Institute of Oulx, planting the first tree dedicated to a condovese partisan still alive: Enrica Morbello Core. At the ceremony the principal Pietro Ainardi intervened, explaining to the group of students present, the symbolic importance of planting a tree in memory of women and men Righteous of the earth. Also present the mayor of Oulx Paolo De Marchis, and the mayor of Condove Emanuela Sarti. Professor Piero Gorza, Professor Donatella Rocca and Professor Barbara de Bernardi intervened and, concluding the program of interventions, told the story of Enrica Morbello Core, who, as the plaque affixed to the memorial stone dedicated to her describes, " for love of her husband and of freedom, chose to stay on the right side, becoming fighter in Valle di Susa in the 114 Garibaldi Brigade". Also present the Forestry Consortium, the ANPI Alta Valle di Susa and that of Condove, Caprie and Borgone. She was a partisan "Fasulin", who for love chose to "stay on the right side"